The many ligatures used, along with innumerable abbreviations, in writing the Greek and Latin alphabets in the Middle Ages were in fact medieval innovations, and not characteristics of original writing practices in either Greek or Latin. Literacy was much less widespread in the Middle Ages than in the preceding Classical period or in the succeeding periods. The Middle Ages was a time when writing could be treated as a code, for use by a small class of people with a good deal of time on their hands, and no need for rapid and accurate reading of complex material in situations in which error had consequences. With the discovery of printing came the proliferation of books, readers, and demanding subjects to read about. It was at this point that tolerance for the scribal ligatures ceased: those ligatures had existed in large part for the convenience of scribes—saving them many penstrokes, saving expensive parchment, and giving them options for reducing word length to aid spacing and justification. (They had other functions as well, which are no longer needed—see below.) Some of those options were useful to printers, but they were not worth the cost of cutting punches for and fitting dozens of extra characters, and then storing them, and distributing them after each use. Ligatures and abbreviations also played a role in the evolution of ways to better distinguish units of meaning in text, which made it easier for the eye and the mind to recognize and process those units—which made reading easier. Ligatures and abbreviations were used only at the ends of syllables and words (later only at word-endings), and arose, along with varying amounts of spacing between syllables and words (less between syllables, more between words, later only between words). Ligatures, abbreviations, and spacing thus became means of separating syllables and words. Practice varied over time, and between regions at any given time. By the end of the Middle Ages or the early Renaissance, the modern practice of spacing between words became the universal standard. At this point, ligatures and abbreviations became superfluous as means of dividing text into processing units: whatever advantage they had was largely duplicated by the word spaces; any remaining advantage was outweight by their disadvantages: ambiguity resulting from the multiple meanings that many of them bore, the vast extension of the number of character forms the reader had to know and recognize, and the extra effort needed to distinguish their often complicated forms. To these disadvantages were added, with the invention of printing, the considerable expense and time of cutting punches, casting, storing, composing, and distributing all those extra characters. 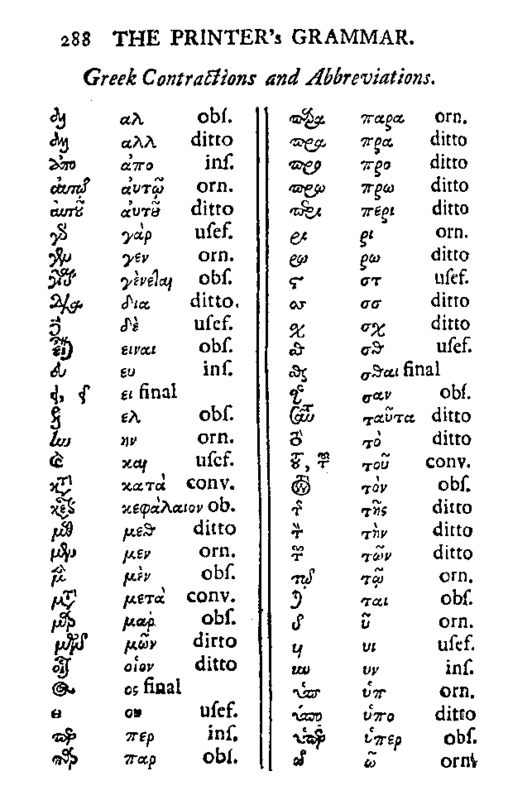 Below, on this page, I’ve placed two tables, one of common Latin ligatures, and one of common Greek ligatures. There’s a chapter on ligatures and abbreviations in Ullman, Ancient Writing and its Influence. When someone tells you that these ligatures added “richness” to the alphabet, and did not impair reading, this is the book you show him to remind him that he never had any idea of how the ligatures were actually used, has never read a book in which ligatures were much used—and that the same is true of the person he is parrotting. This is scanned from John Smith’s Printer’s Grammar, 1755. Smith classifies the ligatures as: obs[olete], ins[ignificant], orn[amental], conv[enient], and usef[ul]. His comments about the ligatures are included below the chart, and are well worth reading. Those comments should indicate why all of them are totally obsolete today, and were maintained in Smith’s day only by a sort of cultural inertia. “Every parcel of Greek Letter being charged with more or less different sorts of Ligatures, Abbreviations, and Contractions, we have thought it immaterial to exhibit all their figures, considering that they are of no other service than to heighten charges, to be ballast in Cases, and to frighten a young Compositor at the sight of the great number of Boxes which they undeservedly occupy. For of what advantage can it be to a Compositor put himself out of his position, to come perhaps to [the Greek ligatures for ai, an, ei, ga, de, di, ko, lu, mo], and hundreds of the like Sorts, in a piece, when he may take up two single letters sooner, out of Cases of common dimensions?